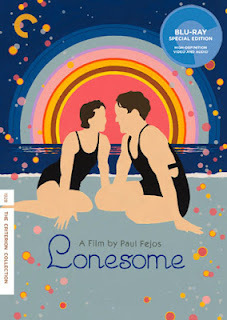 Watching Paul Fejos' Lonesome in 2012 is a fascinating and revelatory experience. A charming and often overlooked gem of the silent era, Lonesome is a unique hybrid of silent and sound, bridging the gap between the two eras with surprising grace. Fejos was all but finished with Lonesome when The Jazz Singer changed Hollywood, and it wasn't long before audiences were demanding more "talkies," and studios were in a rush to oblige. That forced Fejos into reshoots to equip Lonesome with three sound sequences that, when coupled with its dazzling early technicolor scenes, make the film a rare and singular breed. I've long asserted that the silent era was the most creatively rich period in cinematic history, fostering experimentation and testing the limits of the medium in ways that have never been equaled. 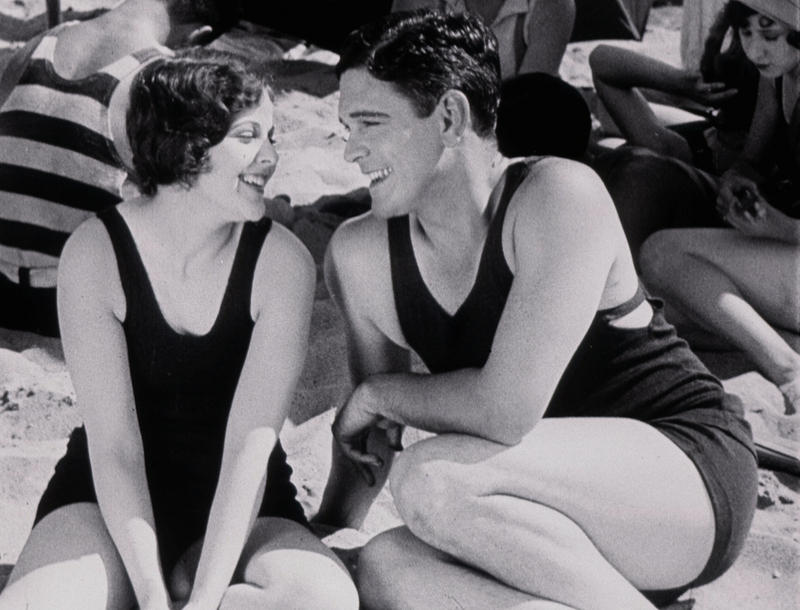 The newness of the movies gave filmmakers the opportunity to explore their new-found artform, to push its boundaries, to write the language of cinema. Barbara Kent as Mary and Glenn Tryon as Jim in LONESOME. Coming at the end of the silent era and the beginning of the sound era, Lonesome is in the unique position of having one foot in both eras. Not quite a silent and not quite a talkie, Lonesome is in a category all its own. Granted, The Jazz Singer was also partially silent. But it's also not a very good movie, notable now only for being the first major sound film. What makes Lonesome so special is that the sound elements don't seem out of place. It's certainly a bit random that characters who have previously spoken only in printed intertitles are now suddenly talking, but it never feels awkward or out of place. It is similar in theme to F.W. Murnau's Sunrise: A Song of Two Humans, which was released the year before. Two working stiffs, Jim (Glenn Tryon) and Mary (Barbara Kent) are tired of the day to day drudgery of their lives. Both dream of something beyond the monotony of their jobs. When the two meet, they initially try to impress each other by pretending to have yachts and other luxuries, but when the truth finally comes out, their sense of relief only adds to their attraction. 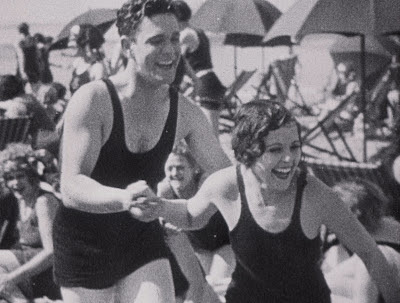 The rest of the film follows their whirlwind romance on Coney Island (beautifully lit in dazzling early Technicolor), on long walks and roller coasters, the lights of New York painting a magnificent backdrop for a intimate love story unfolding on one unforgettable night on the town. Fejos captures the vibrancy of New York and the teeming throngs on Coney Island in a way few filmmakers ever have. The film seems acutely tuned into the rhythms of the city, with its vibrant depictions of bustling New York life. It's also surprisingly naturalistic for what is essentially a fairly schematic Hollywood romance. It never feels as formulaic as it actually is. It feels fresh, fiery, and thrillingly alive. Fejos, a Hungarian doctor, painter, and documentarian, was a jack of many trades, and it is a bit surprising that he is perhaps more well known as an anthropologist than as a filmmaker. He is a fascinating figure whose time in Hollywood was unfortunately short lived. He found Hollywood "phony," and returned to Europe in 1931, where he mostly directed documentaries for the rest of his cinematic career (which ended in 1941). The beautiful blu-ray from the Criterion Collection features two of Fejos' other films - The Last Performance (1929) starring Conrad Veidt, and Broadway (1929), an odd mix of a gangster movie and a musical that is most noteworthy for being the first "million dollar talkie." Neither live up to the charm and joie de vivre of Lonesome. It's an irresistible bon-bon of a movie, a lovely, effervescent celebration of love that is so refreshingly unironic that it may seem a bit naive to modern audiences, but that is merely part of its allure. It's a simpler film from a simpler time, and this terrific presentation is finally allowing it to be discovered by a wider audience on home video for the first time ever. And that is an honor that it richly deserves.